Plexidor Pet Doors: PlexiDor Pet Doors are going to BlogPaws! 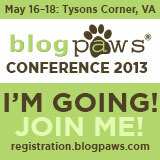 The BlogPaws conference is a pet social media conference that takes place May 16-18 in Tyson's Corner, VA. PlexiDor Pet Doors will have a booth and I hope to see many online friends there. If you're there, come and meet us! The conference offers educational sessions on everything from finding blog content to search engine optimization and fund raising. According to the BlogPaws website, most attendees write about (or as) their pets, but the topics apply to anyone wanting to learn more about using social media. Yea! Have a good time! It was a good conference. I made lots of new four-legged friends. I wanted to take everyone with an "adopt-me" vest home, but the house is kinda full, lol. There are a few times where my mom wants to go to 2 seminars at the same time too, she will have to decide which one is more important I guess.